About a mile off the tip of Southport Island marking the entrance to Boothbay Harbor. Can be seen at a distance off Route 238 at the end of Landing Road from Newagen boat dock. Best viewed by boat. Boothbay Harbor had very heavy traffic entering and exiting its waters, and the rock island the lighthouse presently sits on was quite a serious threat to mariners. Originally established and constructed as a steam driven fog signal house in 1892, shipwrecks continued to occur in the area and mariners petitioned the government to install a lighthouse. On a bitterly cold night In January 1896, Cuckolds fog signal keepers Edward H. Pierce and Clarence Marr rescued six crewmen from the Canadian schooner Aurora with the help of two lobstermen from Cape Newagen. The rescuers were awarded silver watches by the Canadian government for their heroism. In 1907 a light tower was added on top of the house, creating its very unique shape it has today. It was one of the last lighthouses to be built along the Maine coast. In September of 1925, Keeper Fred Robinson saved several persons from a motorboat, which had broken down and was drifting rapidly out to sea. Currently construction is underway to build an adjoining keeper's house. Driving along Route 27 or Route 96 over the island around Southport, you’ll find one of only two of Maine’s swinging truss bridges, which swing open sideways for boat crossings. The Hendricks Hill Museum features an 1810 house with eight rooms of antique furniture. At the Southport Fire Station, you’ll find a replica of a small lighthouse tower on top. Want to stay at a lighthouse? Cuckolds Lighthouse offshore has been remodeled to accommodate overnight guests at what is now called the Inn at Cuckolds Lighthouse. Guests can even rent the entire island for a little peace and quiet. It has all the luxury and amenities. The Maine Maritime Museum offers lighthouses tours and preserves many of Maine’s maritime artifacts and archives since 1607. Tours out of Boothbay Harbor pass by the lighthouse for closer views. At the Coastal Maine Botanical Gardens, you can also take Sheepscot River Cruises for a cruise along the river waterways on board the first and only fully electric U.S. Coast Guard certified vessel in Maine, the Beagle. At the town landing dock at Newagen, you can put in to boat or kayak around the area. 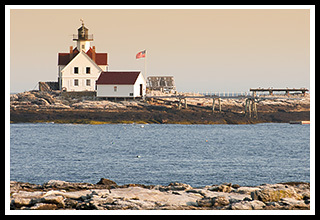 Although the Cuckolds lighthouse is best viewed by boat, you can get a distant view from Cape Newagan on Southport Island, south of Boothbay Harbor. From US Route 1, after crossing the bridge at Wiscasset, follow Route 27 South into Boothbay Harbor. From Boothbay, continue on Route 27 south. Follow Route 27 over the drawbridge and onto Southport Island. Once on Southport, take a left onto Route 238. Take Route 238 for about 4 miles then turn left onto Landing Rd to the end at the village of Newagen. You'll see a sign for the town landing on the right, which will take you to the pier to view the lighthouse. Boat cruises mentioned below may offer many types of cruises. While some may offer specific lighthouse cruises, some may pass by Cuckolds Lighthouse as part of charters, narrated wildlife and historic tours, whale watching, fishing tours and other types of excursions. Chartered pontoon boat for lighthouse excursions with a few passenger in a relaxed atmosphere. 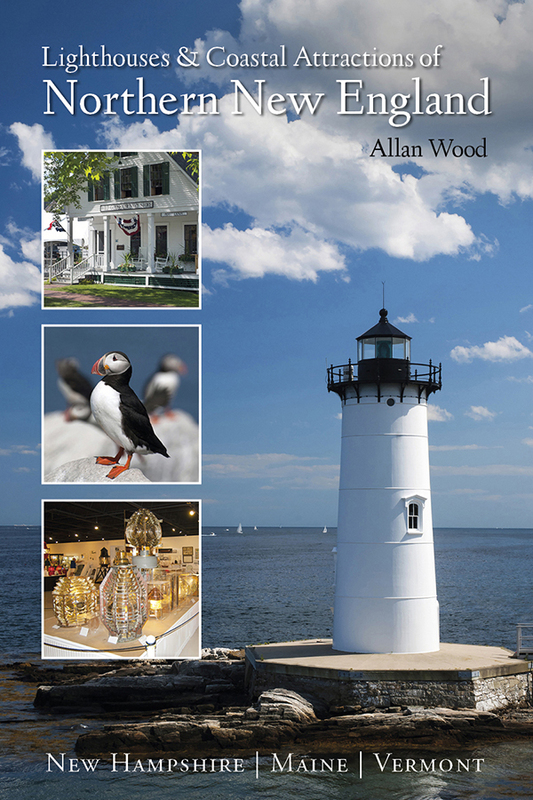 My 300-page book (with over 360 images), Lighthouses and Coastal Attractions of Northern New England: New Hampshire, Maine, and Vermont, published by Schiffer Publishing, provides human interest stories from each of the 76 lighthouses, along with plenty of coastal attractions and tours near each beacon, and contact info to plan your special trips.